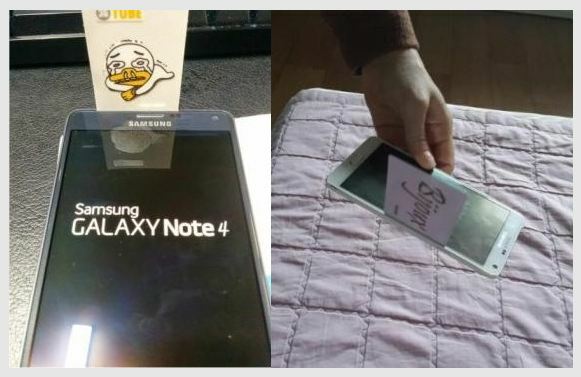 Samsung Galaxy Note 4 Gap is not a Defect! We saw a couple reports coming from Korea claiming about a visible gap between the metal frame and the display panel of Samsung Galaxy Note 4. Earlier thought as a definite defect, it is now being said to be a designed spacing. 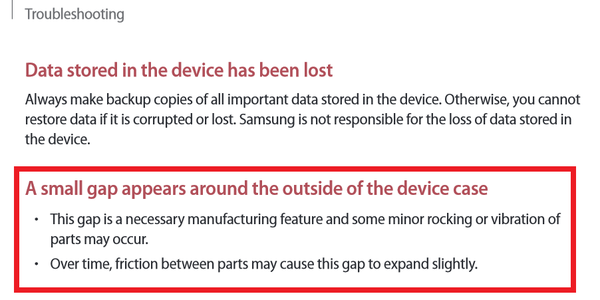 However weird that may sound to you, apparently the design claim is taken right out of the Samsung Galaxy Note 4 manual guide. The above screenshot comes from a page of a 180 pages lengthy guide. Under troubleshooting Samsung has claimed that the Galaxy Note 4 gap is a necessary manufacturing feature. This manual notes that the friction between parts can cause the gap to widen over time. It is odd how would a major tech company let there be a visible gap between the parts as it could get extremely uneasy for the consumer. From cleaning to actually using the device and making it less durable, there are a lot of concerns arising from this spacing problem. We still have to wait and see if the problem is persistent along the devices sold in other regions too. Bloggers who attended the launch ceremony note that there was no such space between the metal framing and the panel when they used the device at launching ceremony. If the problem is reported from other users too, Samsung may have to take up an official position on the issue. It is yet to be seen if the spacing issue gets as spicy and happening as BendGate problem of iPhone 6 Plus. It looks like the both the leading phablets of the year are plagued with some major defects keeping users a little at the bay.